The emerald ash borer (Agrilus planipennis) is a deceptively attractive beetle. They are bright, metallic green insect and roughly twice the size of a grain of rice (8.5 -14 mm long and 3.1 -3.4 mm wide). They start life in an egg only 1 mm long. The newly hatched larva can grow to 32 mm long over a year or two of development. They chew their way through the cambium layer of a living tree’s bark and create a zig-zag tunnel behind it that prevents the flow of nutrients through the tree’s bark in that area. When many larvae chew enough of these tunnels, the tree can be entirely girdled and will quickly die. The larvae overwinter before pupating in the spring and emerge as adults about 3 weeks later. The adult beetles create a “D”-shaped hole as they emerge from the tree. Adults feed on the leaves and soon fly to find mates to begin the cycle anew. The emerald ash borer is a tremendously damaging invasive pest. In its native range of eastern Asia, it seems to be a minor pest -- here in North America, it has proven to be a relentless killer of ash trees. This beetle is harmful for three reasons: 1) it has no effective native enemies in North America, 2) it attacks and kills healthy trees and 3) our native ash have very little resistance to it. While woodpeckers will eat the larvae, they are not fast or efficient enough to curtail the spread of established beetle populations. Infested trees usually show dieback or yellowing of their canopies and sucker growth, followed by peeling bark and finally death in as little as 1-3 years. Approximately 99% of ash trees in an infested region die within 6 years of initial beetle arrival. 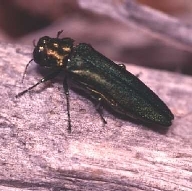 Emerald ash borer was first found in Canada in 2002 in Windsor, Ontario. Since then, it has spread to most of the St. Lawrence region despite best efforts to destroy or contain its spread. Recently, a population has been found in Winnipeg, Manitoba. Similar infestations have taken hold in much of the U.S.A. as well and the beetle is expected to continue to expand its range. The transportation of wood products, especially firewood, is a major factor in this spread. While there is no native ash forest in Alberta, approximately 60% of the boulevard trees in Edmonton are green ash. Because of this, much of our urban forest is at serious risk. If left unchecked, emerald ash borer could cause untold costs to our quality of life and local infrastructure (beetle-damaged trees fall apart with little provocation, damaging houses, vehicles and citizens alike). It is extremely important that we avoid transporting firewood from place to place, as this is one of the easiest ways for emerald ash borer to spread. Adopt “burn it where you buy it!” as a mantra! Nursery stock from out-of-province is also a potential way for emerald ash borer to spread. Detecting emerald ash borer is difficult in the early stages of an infestation when we have the best chance of controlling it. If you suspect that you have found an emerald ash borer, please call 311 or email treebugs@edmonton.ca. If you find an ash tree in decline with flagging (individual branches dying, leaving dead leaves behind that do not easily fall), please call 311 or email treebugs@edmonton.ca. Every extra set of eyes helps! This Emerald Ash Borer guide is intended to assist insect diagnosticians and others who have some familiarity in identifying insects. This guidebook will help people interested in tree care to detect trees that have been attacked and damaged by the emerald ash borer.